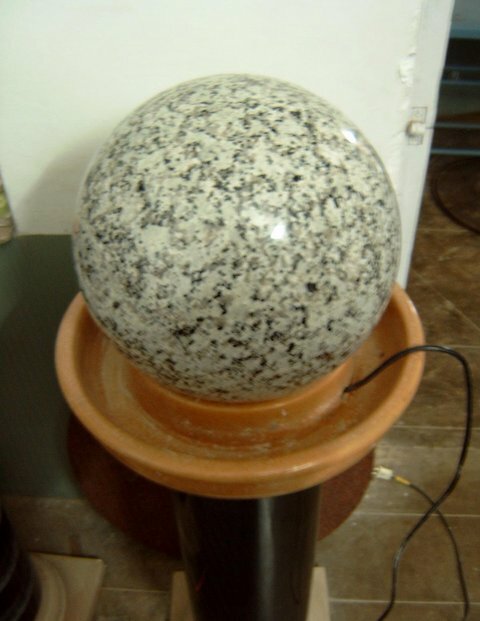 Granite sphere fountain are perfactly balanced, polished stone sphere that fits into a socket (base) carved to the exact curvature of the ball. The sphere revolves 360 degrees in all directions and actually floats on a thin film of water.Has a granite ball floating on a pressurized stream of recirculated water. This rotating globe is recommended for use in main entrances, shopping centers, gardens, etc. 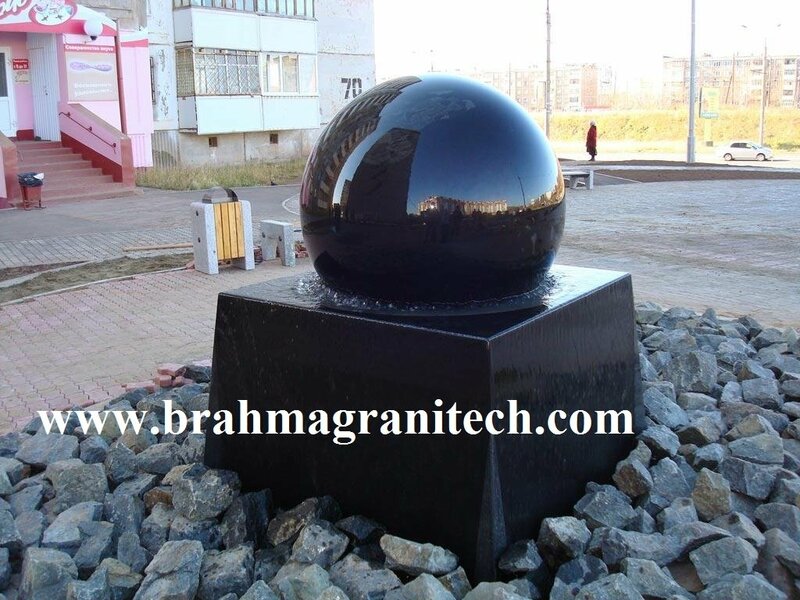 Black granite sphere fountain on round gray base.Floating Ball Fountains consist of a precisely machined and polished solid granite sphere resting on a granite base with a precisely machined socket. Water is pumped up through the base at 12-20 psi, causing the ball to "float" and gently rotate. Each fountain is a unique work of art - no two are alike. The spheres range in size, color, and texture and the bases can be made from the almost infinite variety of granite available. 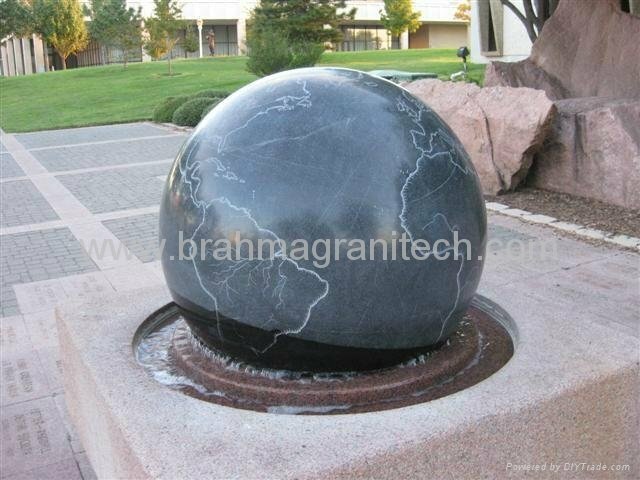 White Granite sphere fountains on black column base. 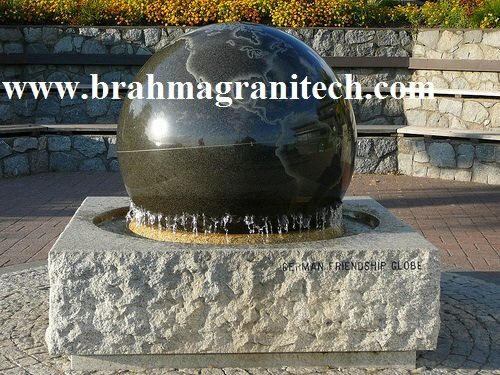 Floating granite ball fountains up to 10 feet in diameter mystify, attract and enthrall visitors. 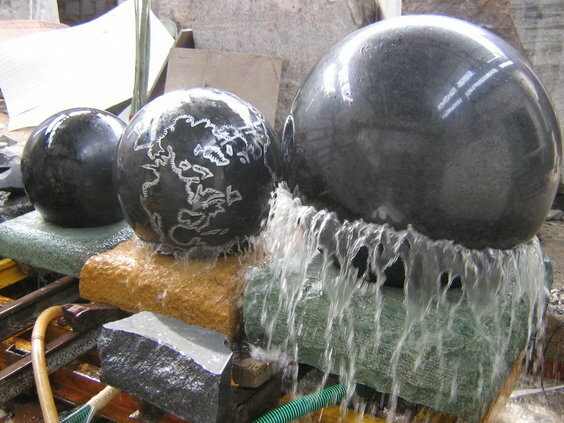 These beautiful balls, sculpted of highly polished granite, are painstakingly engineered to float on a thin layer of water. A little push of the hand starts the balls- which may weigh up to 84,000 pounds- rotating. This amazing sight fascinates and attracts visitors who, of course, want to give it a try. 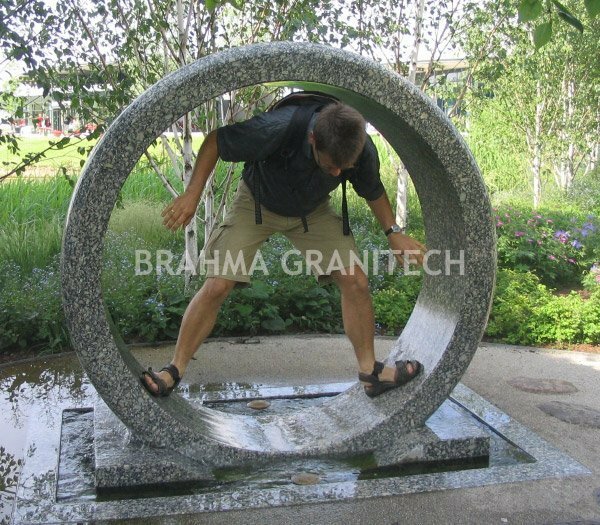 Brahma Granitech, a manufacturer of granite rolling ball fountains, is located in the historic city of Jalore, northwestern India. 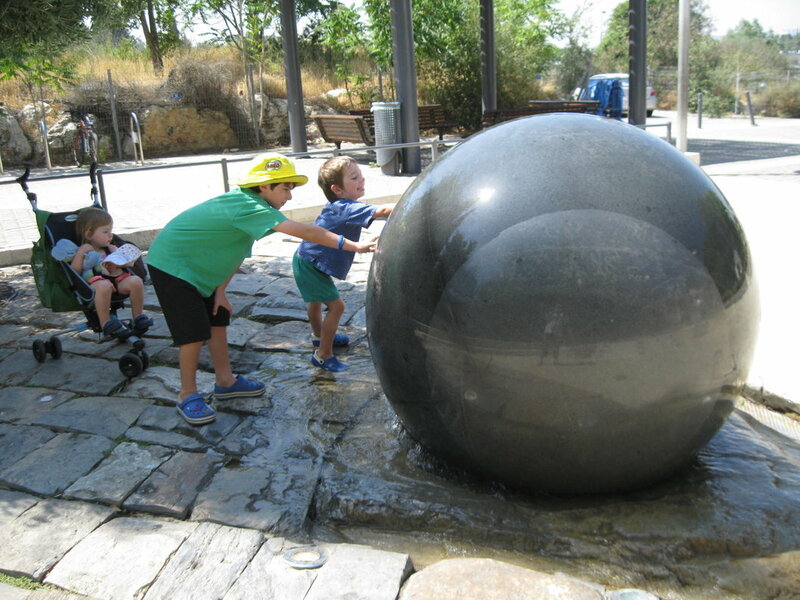 We have nearly 30 years experience manufacturing the kugel ball fountain, a type of granite ball fountain or marble ball fountain, seen at famous locations across the world. Kugel is the German word for ball or sphere and is used for many types of revolving ball fountain, spinning sphere fountain or rolling ball sculptures. 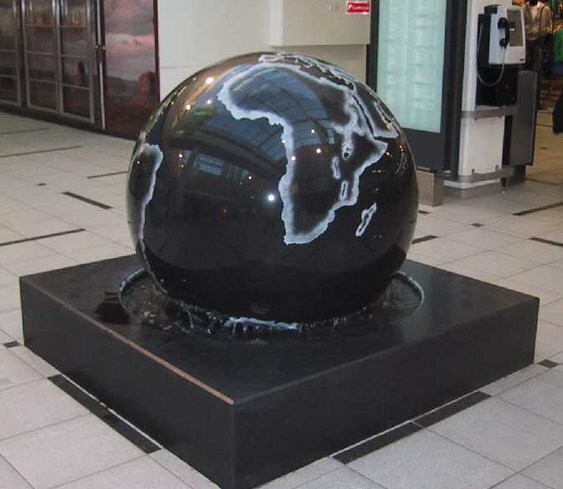 Our primary product is a natural stone water feature which is a stone globe that is finely engineered to become a floating marble sphere guaranteed to amaze people young and old. 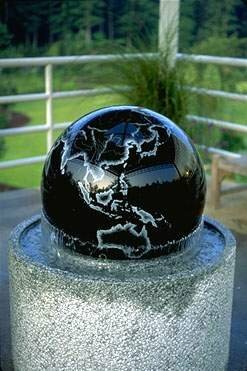 These granite or marble sphere fountains will attract business and interest as few can resist the temptation to walk up to a turning ball fountain and stop a 10,000 lb spinning marble globe or granite globe with just their hand. Far more than a piece or art or sculpture, the interactive aspects of a stone floating sphere fountain is what will set your location apart and guarantee that visitors will leave in wonder. 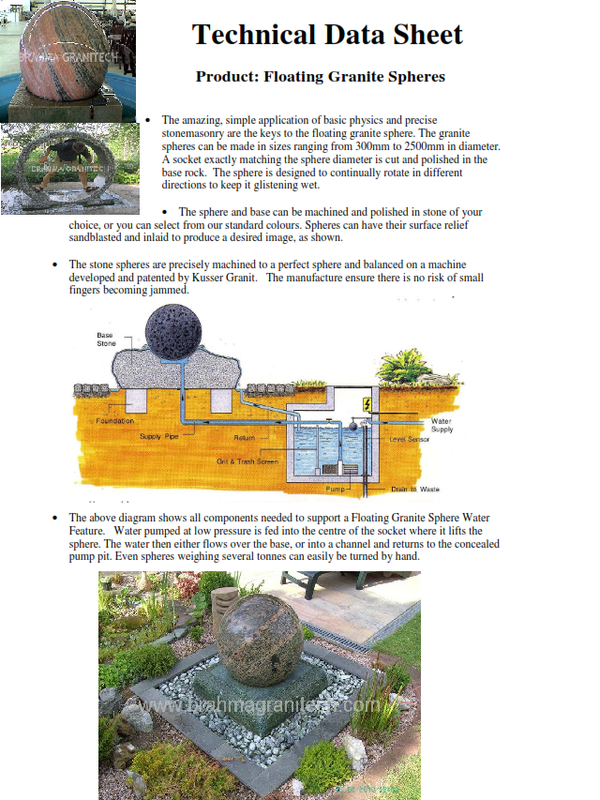 The uniqueness of owning a stone floating sphere fountain or garden sphere fountain will almost guarantee that your business or garden will be noticed. Compared to the cost of conventional advertising, this permanent and visually striking piece of art will pay for itself in a very short time. 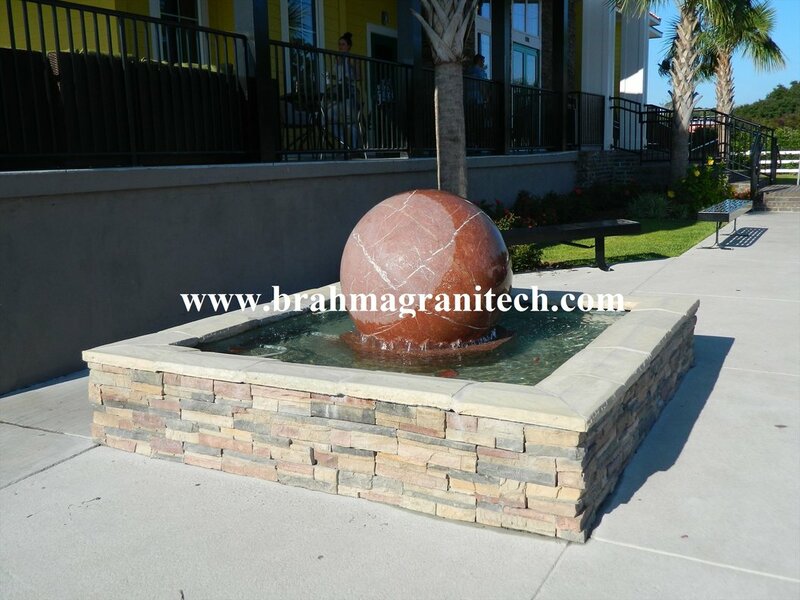 When you order your ball fountain from Braham Granitech, you will know that the marble or granite for these natural stone water fountains is hand selected by our experienced masons and stone workers so that only the finest material is used to manufacture your floating stone globe. 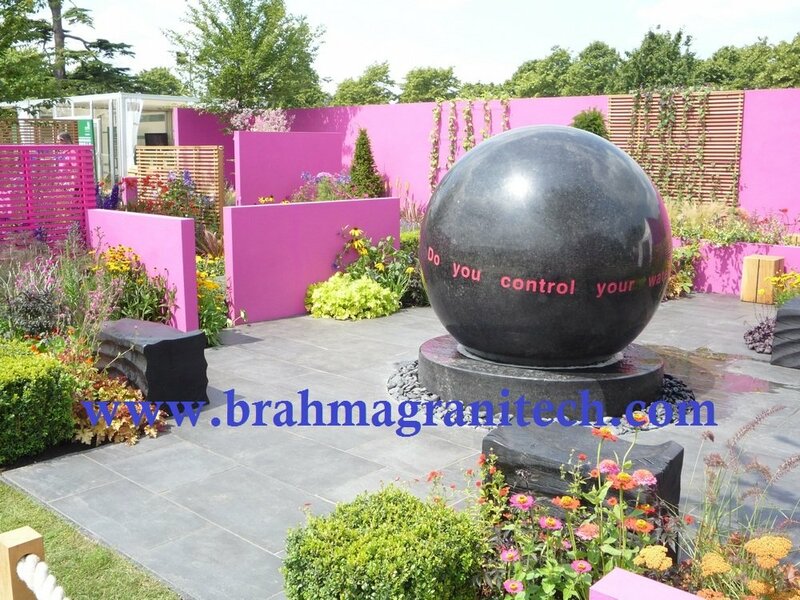 Our award winning stone cutting machine was developed by the founders of Brahma Granitech in the 1990’s and this engineering feat is what makes the precise cutting of a moving sphere fountain, or globe fountain, possible. The principles behind a rolling stone globe are actually quite simple. But, as with many things in life, making them actually work is a lot more complicated. To make a ball water feature, we start with a block of granite or marble that you have chosen from the many styles and colors available. We can manufacture a fountain stone ball or marble stone ball in sizes from 1 foot to 10 feet in diameter. The cutting and polishing of these floating spheres has to be extremely precise as the exact fit between thAdd Content/Layoutse fountain ball and the curved base is what allows the magic to happen. 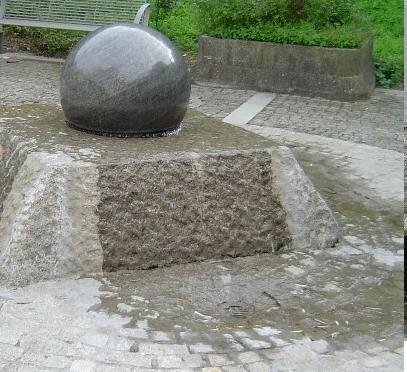 When water is pressed between the curved base and the water feature sphere, the small film of water (about 8/1000th of an inch) causes the water feature ball to hydroplane and rotate. One might think that you would need a huge and expensive pump to float a massive garden water feature ball but the pressure needed is about the same as comes out of a standard garden hose. The globe revolves 360 degrees and water pressure keeps moving in all directions by special swirl curves cut into the base. These floating globe water features are ideal for residential and commercial complexes, public spaces, shopping centers, children’s parks or private residences and gardens. They are low maintenance, environmentally friendly using re-circulated water, and just plain cool looking! 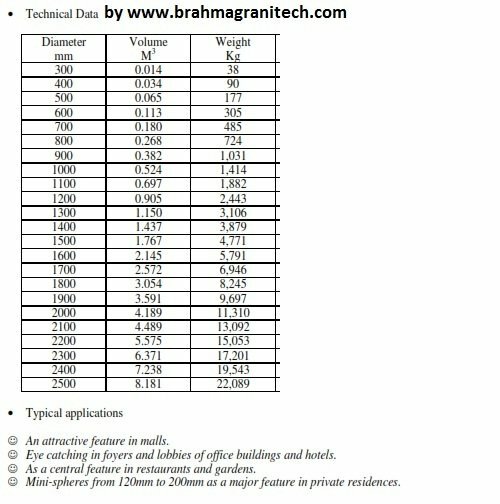 Brahma Granitech with work with you from start to finish, achieving the design and looking that you desire. Bases are custom designed to your specification and both the base and the ball can be engraved with any motif or logo. You will follow the manufacture of your water feature sculpture from stone selection to finished product. We send photos along the way and many customers choose to display these production photos to further amaze visitors. Your rotating globe fountain will be securely shipped in hardwood crates reinforced with welded steel corners. We assist you will all shipping and paperwork. We offer installation guidance customized for your application and will work with your builders and engineers to offer advice so that you can achieve the best result from your investment. You will be working directly with the founders and owners of Brahma Granitech. We are a customer focused company and our ability to interact directly with the customer to make each ball fountain unique is what sets us apart. Email Samrat (founder) today at ballfountain@gmail.com. You will be glad you did.